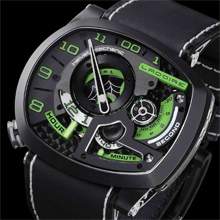 Ladoire Genève introduces “Black Widow”, a collection inspired by the nickname given to the dangerous Lactrodaectus Manctans, a metaphor artfully spun around the theme of spiders, like the famous emblematic web engraved on the GMT ratchet wheels. Lionel Ladoire has created a model with dimensions as daring as those of its predecessor, while featuring a slimmer and smaller case measuring 41.77 mm along the 12-6 o’clock axis and 50.84 mm across the 9-3 o’clock axis. It reflects the characteristic asymmetrical design of Ladoire creations, underscored on this model by the single lug. Distinguished by an elongated profile and taut lines, the ergonomic nature of the timepieces in the Black Widow collection combines wearer comfort with an aggressive character exuding a sophisticated aesthetic appeal. The deconstruction of time display favoured by Lionel Ladoire is conveyed through a dial with green, red and white accents which, along with the choice of materials and finishes, are the key signature features of the various models in the Black Widow collection. The dial structure, openworked to reveal the movement, is multilayered and delineates three regulator-type offset Hours, Minutes and Seconds zones with patented display complication (HMS Planetary®) mounted on a ceramic micro ball bearings. 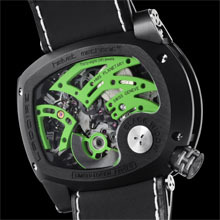 Moreover, the watches in the Black Widow collections also feature a GMT function with a central hand adjusted via a fastaction pushpiece at 2 o’clock. Crafted in harmony with the rigorous criteria governing fine leather workmanship, the strap used in the Black Widow collection is made from a single piece of full-grain, hand-sewn matt leather or alligator leather, secured by a hand-made Ladoire Helvet Manufacture pin buckle.